I’m sooooo excited to be in this November’s issue of Runner’s World Magazine! Nope, they didn’t write an 8-page article about me just yet, but I am one of three Instagram photos they chose to feature on Page 6! Every month, Runner’s World picks a subject and hashtag for fans to participate in a community conversation. 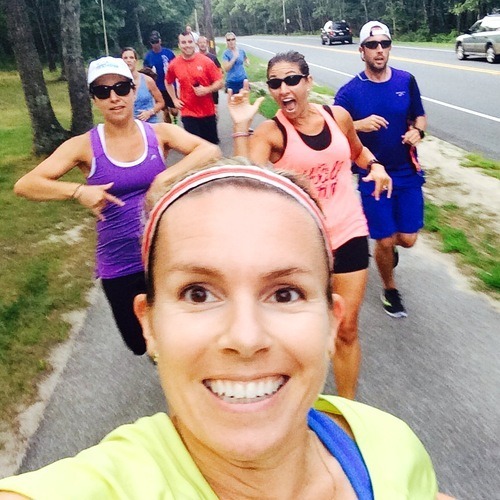 A little while back, the subject was “group runs”, and I tagged one of that week’s photos (below) from our Marathon Sports run club with the hashtag #RWgrouprun! Well, no special treatment here – it took about TWO WEEKS longer for me to get my copy in the mail than anyone else! Friends have been texting me photos, but I had yet to see for myself until yesterday. Finally, there it was in my mailbox! I share this page with two other winners: jesstweedhope​ from British Columbia and miz262 from Chicago! THANKS Runner’s World! As a former/current marketing professional, I also love checking out the many ways brands are using social media in new ways. Sharing three and only three photos, very early in the magazine, is brilliant! I sure feel special, and that definitely encourages participation in each photo contest! Oiselle does this too, using the hashtag #flystyle. If you’re shopping on their site and you click on a pair of shorts, for instance, you’ll quickly see many real-life photos of real-life women wearing the same pair of shorts! Vineyard Vines does a great job of marketing their Instagram handle and the hashtag #EDSFTG (every day should feel this good), which fosters a community of carefree, relaxed lifestyle to match their brand. Are you participating with your favorite brands on Instagram? Maybe you’re using it for your own blog or business? It’s my favorite form of social media these days, so find me there!